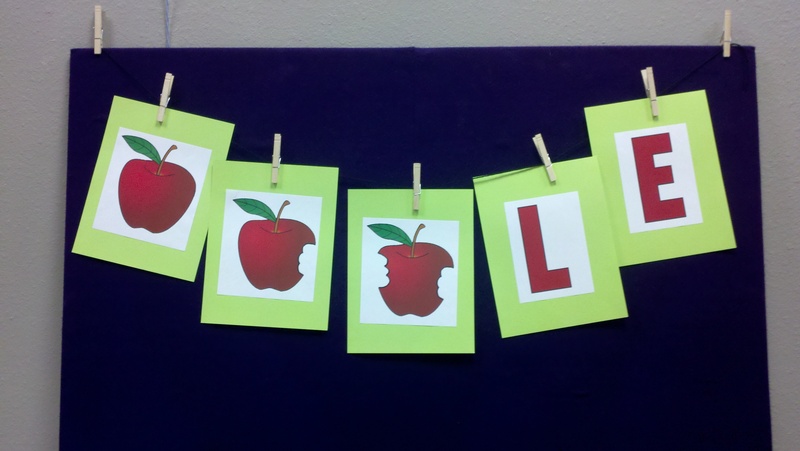 This week I did a theme that’s a September favorite: Apples! 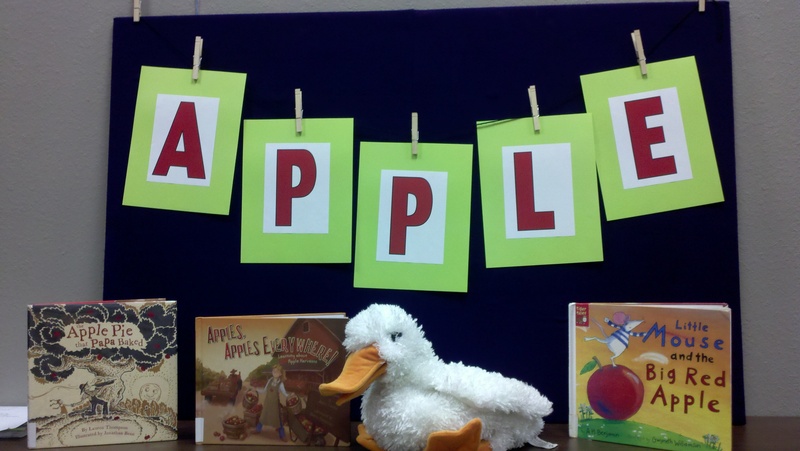 I had originally planned to use this theme next week, but there have been so many preschool teachers coming into the library for apple books that I figured that the sooner I got my storytime books back on the shelf, the better. ***Edit*** Looking for more apple storytime ideas? Check out my Apple Favorite Theme Post! I decided to change things up a little bit this week and start with an activity instead of a book. I got the idea for this one from the lovely Rovingfiddlehead Kidlit. I know a fruit that’s good to eat and apple is its name-o. 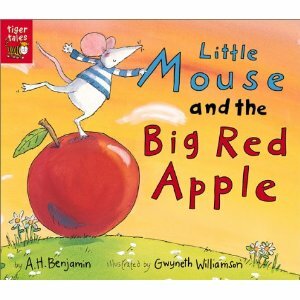 In this story, little mouse finds a big, red apple and decides to roll it home for dinner. When he runs into a few roadblocks, his friends help him out, but little mouse is reluctant to share the apple with them. I have to admit that I didn’t really like the fact that little mouse was so against sharing with his friends. Even in the end, he shares almost against his will. However, this book did lead to a great discussion about how important it is to share! 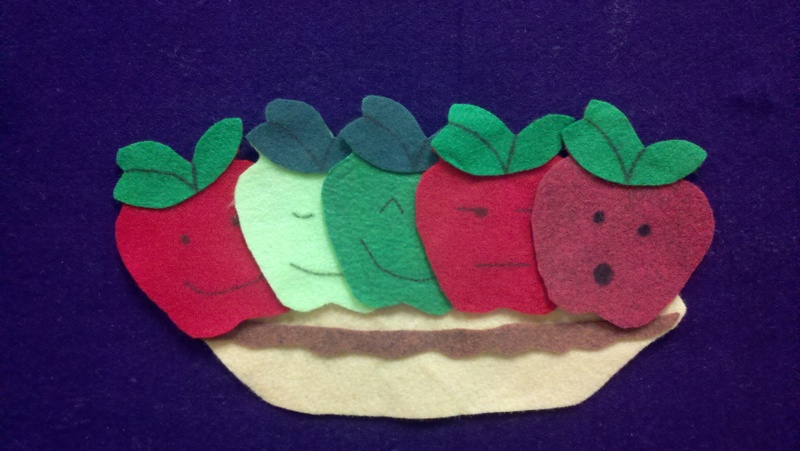 I saw this rhyming flannelboard on Future Librarian Superhero’s blog, and I thought it was waaay too cute not to include in an apple storytime. The children didn’t seem to get the slightly morbid humor in the las line (though they all exclaimed that they loved apple pie! ), but the parents giggled. 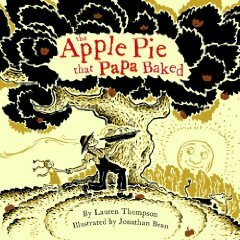 This is an interesting book that starts with a simple apple pie then takes a step back to examine everything that goes into making that apple pie, from the apples, to the apple tree, to the roots of the apple tree, to the rain that waters the roots, to the clouds that bring the rain, etc. The illustrations are beautiful and utilize very few colors (one of them red, of course). I wasn’t sure how much the children would like it, but it held the attention of both of my storytime groups. Sometimes storytime helps you discover where the weak parts of your collection are. I was not happy with our slim selection of apple books, and once the fiscal year starts up again in October, I have grand plans to buy more apple books. 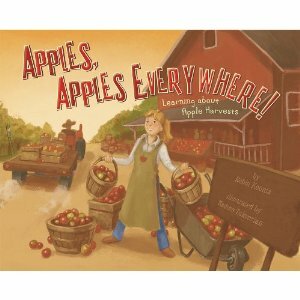 But since I was left with slim pickings for storytime, and seeing as most of our apple books were old and falling apart, I resorted to a none fiction book about apples. It worked out fairly well. The children all made faces at the part that talked about apple worms. Thank you for writing it! If it weren’t for your book, I would have had a very short apple storytime for the kids. Hi! Do you still have your GIMP images of your apples? I’d love to use them. We aren’t allowed to download software onto our computers, so I can’t use GIMP. I’m inspired by your flannel boards and because of you and your blog I’ve added lots more flannel boards to my story times. Hi! I’m glad my blog has been inspiring you to add more flannelboards to your storytimes. 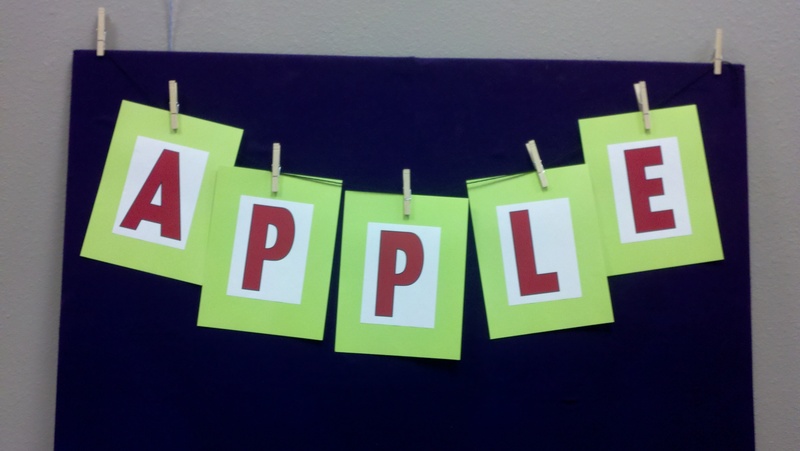 I did keep my apple files, and I went ahead and edited the apple storytime blog post, adding the files as PDFs. You should be able to print them directly from your computer. Great storytime plans! I’m a new children’s librarian and was looking for some ideas. You really helped me out.